In my opinion, eating, dinner in particular, is meant to be a community event. Growing up, family dinners were a must; precariously balanced between board meetings, ballet, baseball and boy scouts, but they happened every night. For that I am grateful! Now that I have my own house and dinner table, I find it just as important to have friends and family over for dinner as often as possible. I also love going to our friends’ homes for dinner, sharing in the preparation and enjoying great food, with even better conversation. It make me happy and feel grounded, I need it. We had dinner with Alaina’s student teaching mentor teacher and her husband this weekend. They hosted us at their home in West Olympia, where Dan grilled on the back porch while we talked about business, blogging, and information science, and Alaina and Kati chatted about school, weddings, and Olympia life. We ate dinner, drank wine, and that amazing kind of conversation which makes time stand still. That is, until we were getting ready to leave the dinner table and realized it was midnight! Locally raised steaks on the grill and fresh crisp asparagus salad, both from the farmers market, reminded me that spring is here and summer’s late patio dinners aren’t too far away. but it total deserves an encore performance. Prepare the asparagus by snapping off the ends. Drizzle lightly with olive oil and sprinkle with basil, oregano salt and pepper. 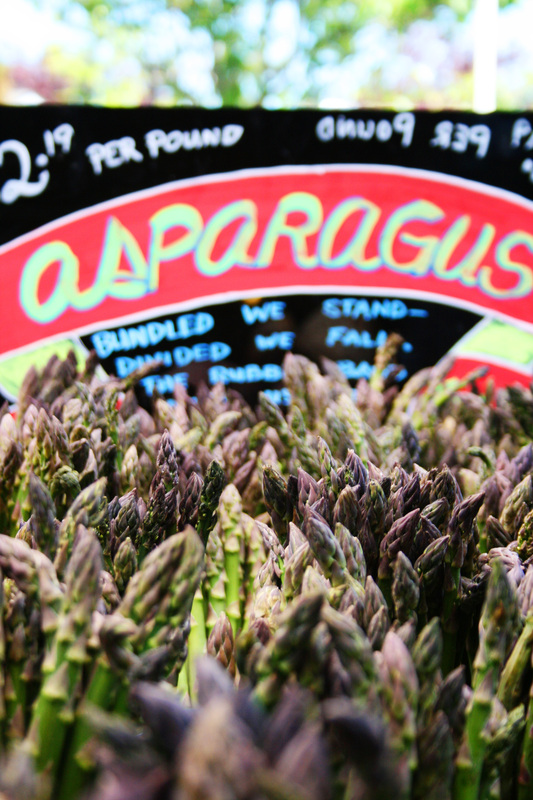 Grill, roast or broil the asparagus until tender, but not soggy. I bake them at 350°on a baking sheet for 10-15 minutes, tossing occasionally. Allow them to cool. In a large bowl, whisk olive oil and vinegar together with a 3 to 2 ratio (For two salads I think I used about 3T. oil and 2T. vinegar). Add a generous amount of salt and pepper. This entry was posted in Farm-to-Table, Recipe, Salad. Bookmark the permalink. Yum! I’ll check it out. We love stir-frying!